I had the opportunity this weekend to go through some of the [many] boxes of figures and projects I have in my garage storage area. I like to do this from time to time to keep the various figures I have in my mind, and to decide which amongst my various projects will I bring in to the house to ignore and fail to finish next. Example: Cheetor's post on an Olly Ogryn reminded me that I have some too, and I looked through one of my Imperial Guard boxes to check them out again. 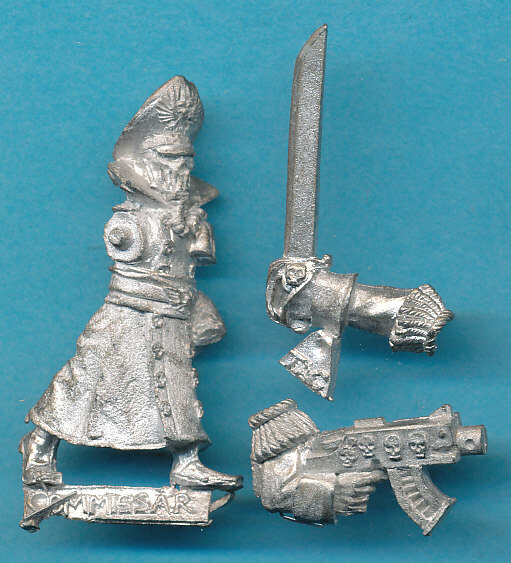 In one of my project bags I found the expected figures and bitz for a planned conversion... and this guy. 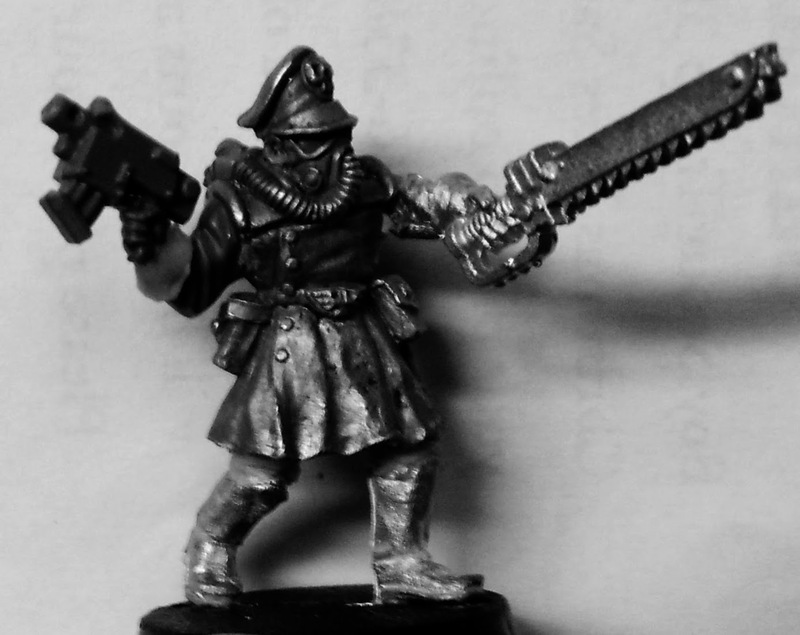 Hmm, a complete Steel Legion Commissar (arms not shown). 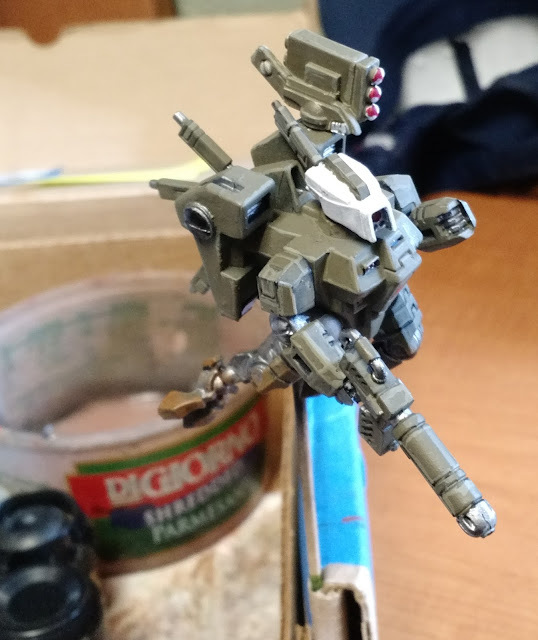 Now if only I had not just recently converted and painted one. This guy is headed for my growing "Ebay" pile. 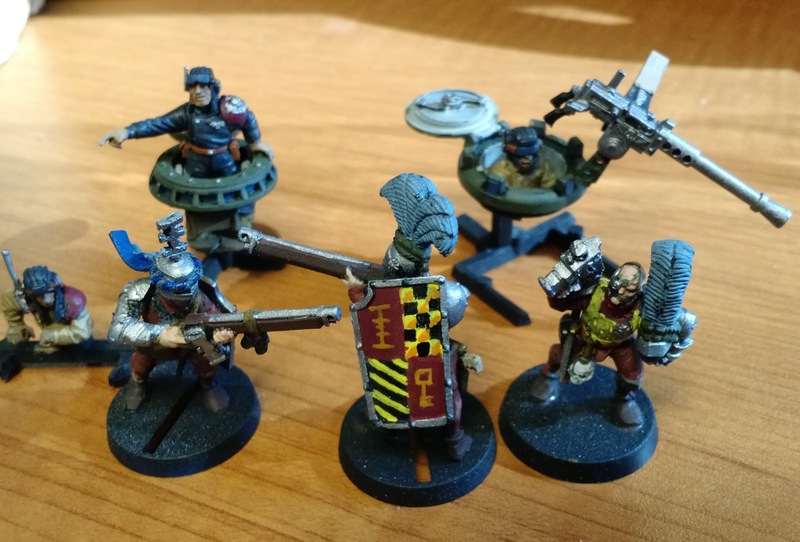 Pictured is the sum of my painting for this week, which includes the base coats on three tank crewmen and base coats on three Inquisitorial Castellany troopers. Not too much, but they should finish up quickly when I have the time to take another crack at them. Particularly pleased with the heraldry on the pavises. That I am so close to finishing it seems sort of unbelievable at this point... just some washes, sealer, and affixing it to its base to go. I will endeavor to get a whole army picture when I can. Third try to get a good picture of this figure. I used my wife's DSLR camera for this, so you can click to get the picture to be really huge if you like. The yellow is not so dirty in real life, or at least I like to think it is not. I think the lesson here is that I am just not a very good photographer. Anyway, I only have about 50 of these to paint (and another ~20 of aspects, plus vehicles...), and it was relatively quick. Like many, I got a "free" Age of Sigmar Stormcast Eternal as a cover mount on the old weekly White Dwarf magazine. 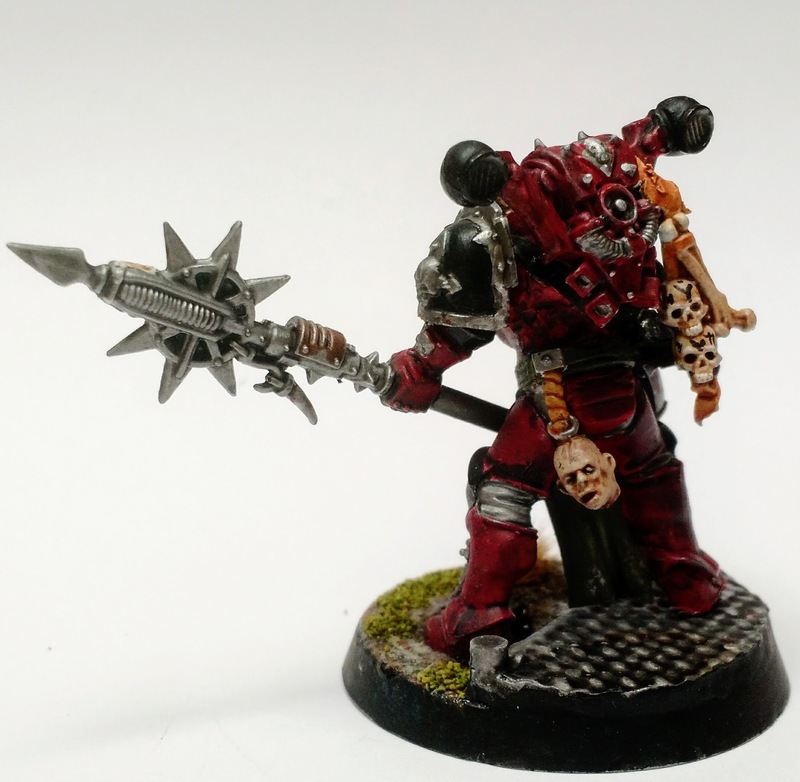 As the idea of the "Sigmarines" interested me not at all, I decided that the figure would be converted to a true scale space marine, and given the nature of the armor, quickly settled on a Chaos one. 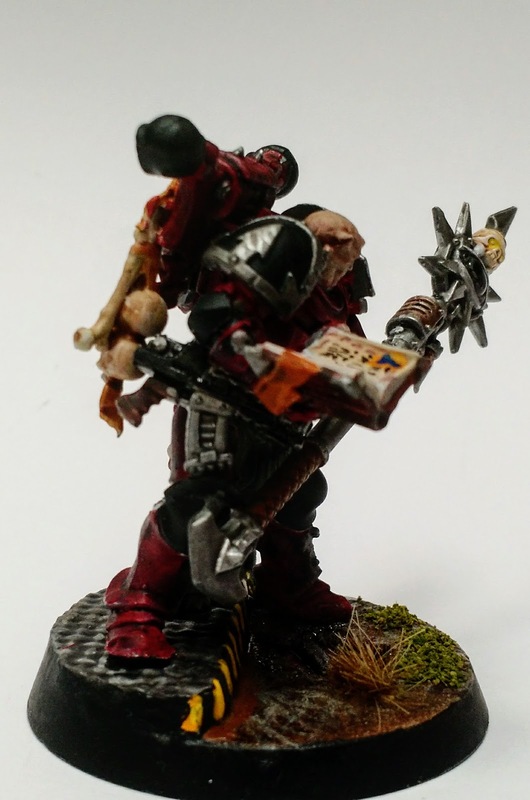 I added some leftover bitz from a Chaos Terminator Lord, and sculpted a few addtions as well. Then like most conversions, I put it in a drawer for a while and it did not get paint. This summer, I realized that the figure had been completed for a year, and determined that I would paint it, and after some fits and starts, it got completed before Christmas. 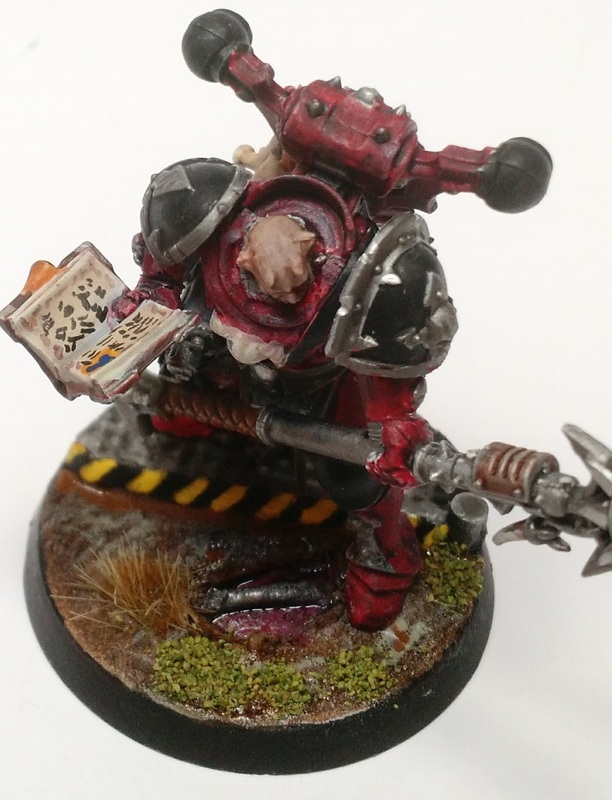 The primary armor color is a Word Bearer maroon that I created by painting blue ink over scab red. Has a very deep color when it worked out correctly, but the blue ink wash pooled a bit much in a couple of areas making it more blotchy purple there. Anyway, I am pretty pleased with it, what do you think? A small expansion to my Tau forces, in the form of a Stealth Suit team. However since I plan to use these predominately in other rulesets (mainly Stargrunt II), I gave the unit leader some alternative wargear, and magnetized the weapons to allow for this to work out. In the 40k rules, stealth suits can cloak themselves, and many (better) painters show this by painting the figure to match the background and then having them "decloak" into the standard army paint scheme, but I just went with the easiest paint job so as to get it done. 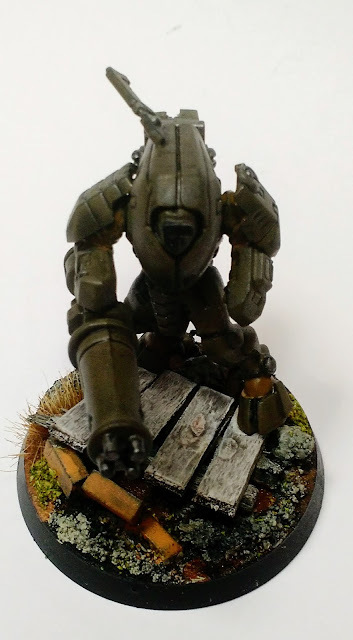 However, being a bit nuts, I went a bit overboard with basing this guy, and built a picket fence for him to be tromping over. I got this box as a gift from my sister a couple of years ago, so it pleases me to "put them to bed" so to speak, and finish off the project. 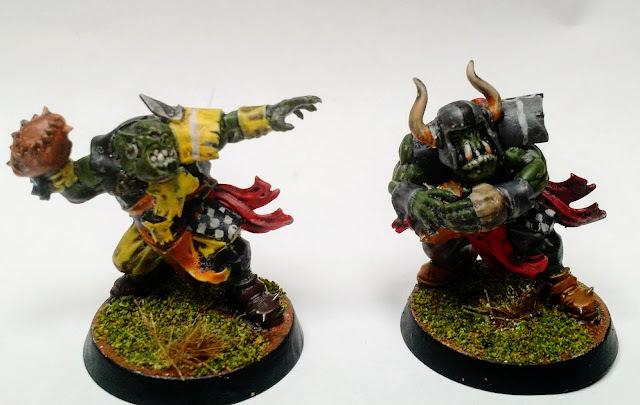 As I mentioned before, I painted and finished a few figures before Christmas for my sister and her sons. The spray finish was difficult to achieve given the weather (a high temp of just below 10 Celsius, and rainy), but a portable electric space heater got the job done at last. First are the two Bloodbowl Orcs I painted for my American Football mad nephews. 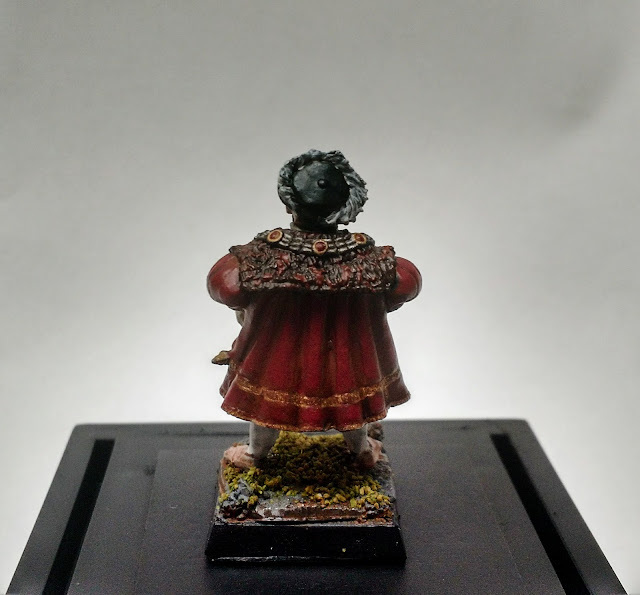 The figure I painted for my sister is one I previewed in December, namely the Copplestone Casting Henry VIII figure. I bought this figure to paint for her about 10 years ago, but never managed to finish it due to some issues with replicating the classic Hans Holbien the Younger painting it is based on. 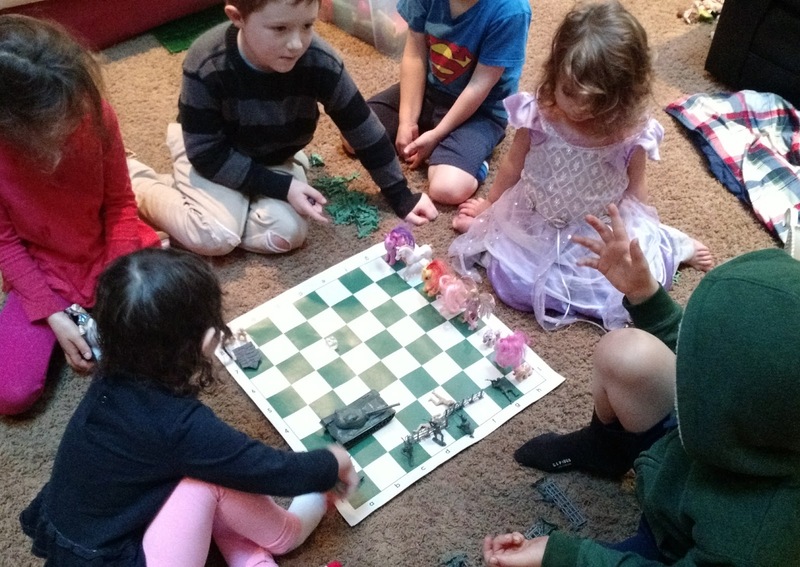 All three figures were given magnetic bases, and placed into golf ball boxes. Why one would want to collect golf balls in tiny plastic boxes, I will never know, but they work great for single figures! 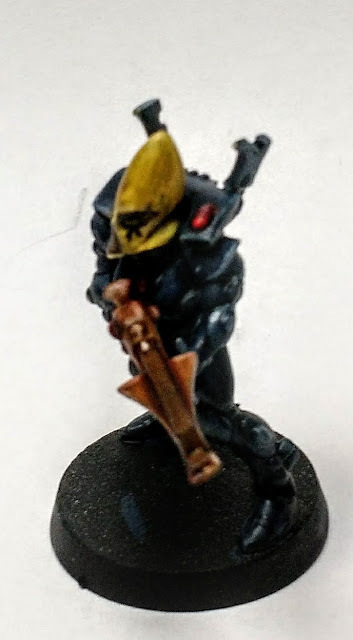 Continuing on with my Eldar painting experiments, I managed to build and paint a full figure recently, which then languished until I had a chance to seal off the paint. As I mentioned the previous post, I greatly admired the original blue suit yellow head look, and used it here on a mixed vintage plastic figure. Unfortunately my pictures are not the best, but here are a couple of shots where you can see the effect. The blue of the armor is significantly more matte in person, but the color is not far off. 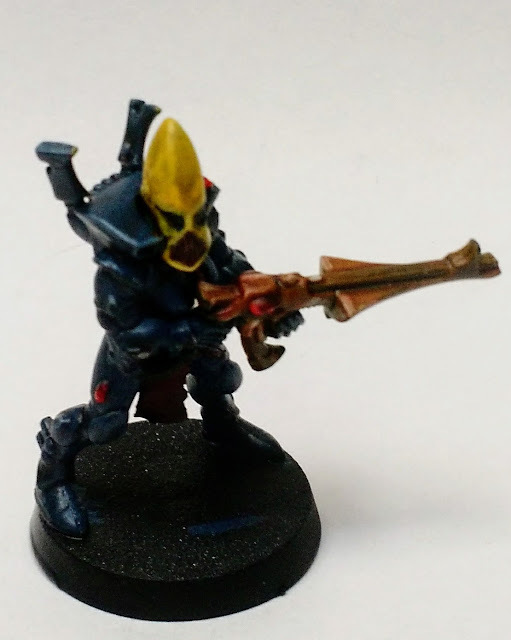 The plan is to do basing in that newfangled red crackle stuff GW puts out these days, which should work nicely with the deep blue of the armor and the yellow of the heads. Since it seems like the time to discuss the plans one has for the forthcoming year, here are mine. I want to paint a bit more, play a few more games, and clear out some of the accumulated clutter I have gathered over the 20(!) years of hobby. To that end, I am trying to set some actual goals, plan out purchases in advance, and possibly plan a hobby/game day with some buddies. Plus sell things. I actually went through some of my many boxes and pulled out a number of items that I can possibly live without. This is very hard for me, because I have a fairly good memory of what I wanted to do with each item, and feel bad about giving up on the projects. However, things must go! So in the next month or so I will pitch a lot of it up on Ebay. Ideally it will garner enough to offset the items below. and the Baneblade at last! 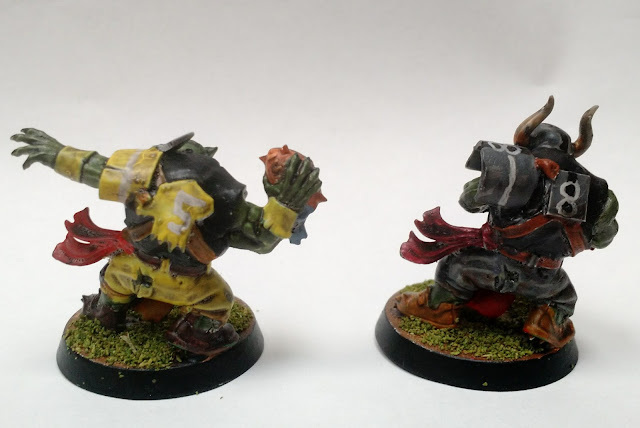 Challenges: Besides the possibility of the lure of Ebay throwing a spanner in the works, I tend to be very slow at painting and finishing projects, am easily distracted by new projects, and we may be moving house this year as well. So no promises that any of the above will really happen! Many years ago now, when Inquisitor was morphing into Inquismunda, I was inspired to read through the Necromunda rules, and build a few characters. The only figure that went anywhere was the Bounty Hunter, which has featured in many background shots over the years as a sort of measuring figure. 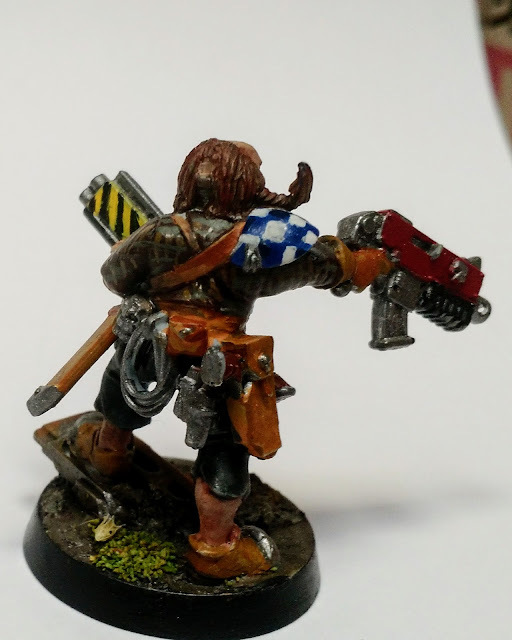 As a Necromunda bounty hunter, he has a the somewhat daft armament of a bolter AND a shotgun, which is pretty silly, but it did make for an interesting pose. 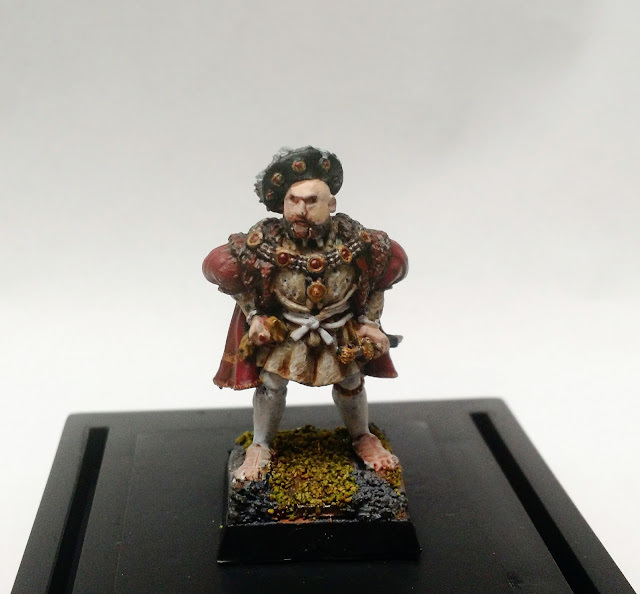 This past Christmas Eve, I managed to finally finish the figure, and here he is in all of his seedy "glory". 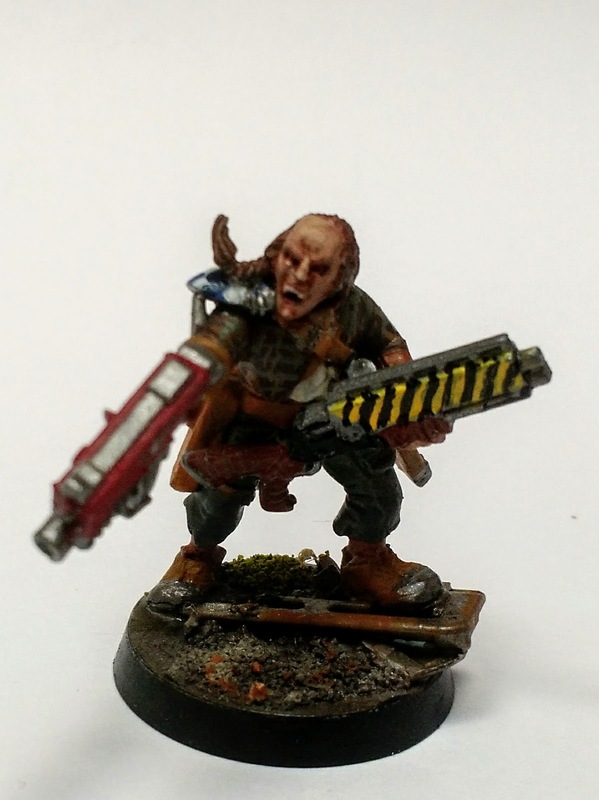 The Imperial Commissar has been part of the Imperial Guard since the very first days of Rogue Trader, appearing in WD109 back in 1989. The first four models models were single piece sculpts, like all figures were at the time, and were sculpted by Mark Copplestone. These were quickly supplemented with a further six built to take advantage of the new plastic arm sprues available for the IG. 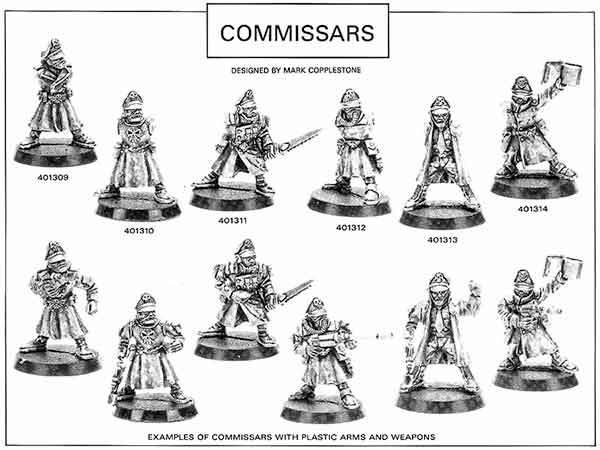 After the RT era ended, 2nd edition Commissars were produced, which were larger and more detailed, but returned to being all metal (although multi part). Later, when the Steel Legion came out as part of the Armageddon campaign, Imperial Guard Commissar body #2 was modified to have a gas mask to fit in with the toxic atmosphere of Armageddon. The figure was not given any of the other Steel Legion items, like bedroll, heavy gloves, or canteen. 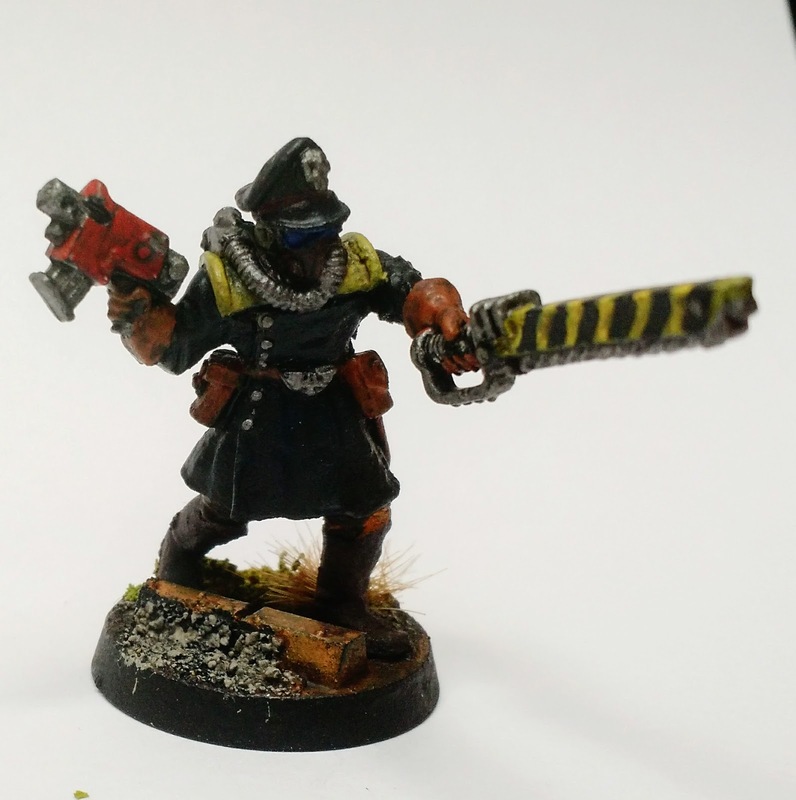 I do not have that figure, but I still want a Commissar for my Steel Legion company command. As it happens, I DO have figure 401312 from the WD114 picture above, and he is wearing a gas mask... perfect for conversion! 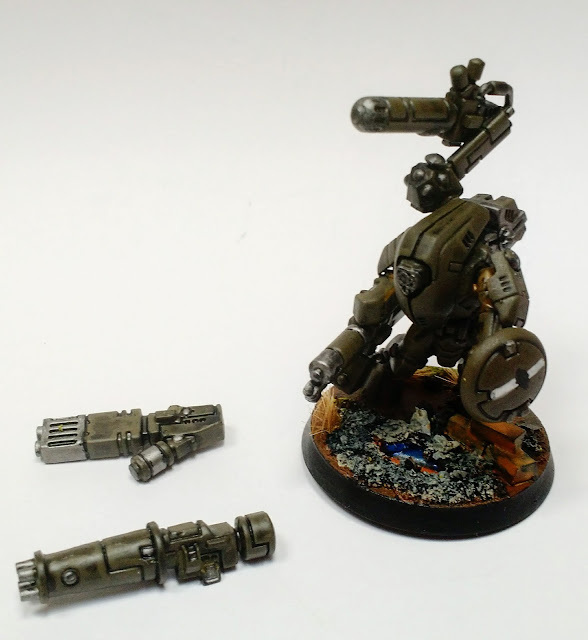 Compared to the much newer Steel Legion, the figure is a bit crude, and short, with some curiously large feet, so I will convert those. 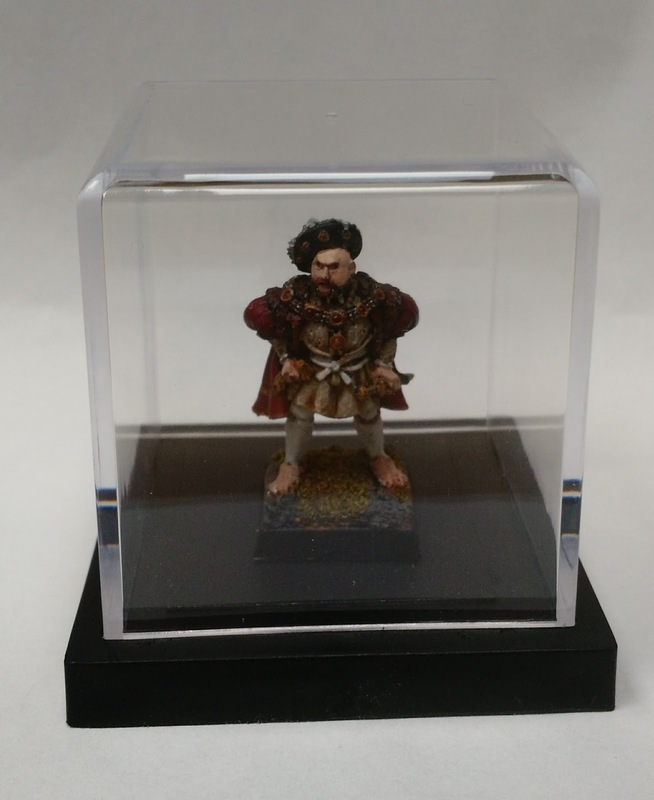 The first thing I did (well, first thing after having the figure sit in a bitz box for 18 years after I bought them from some bloke on rec.game.miniatures.warhammer), was toss the figure into a container of Simple Green to get the black and red paint off. A few days of that, and the paint sloughed right off with a bit of toothbrushing. 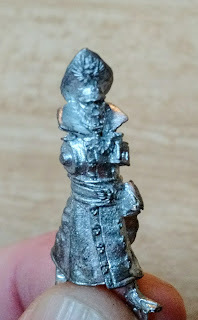 This also broke down the old super glue holding on the plastic arms, and I put them aside. 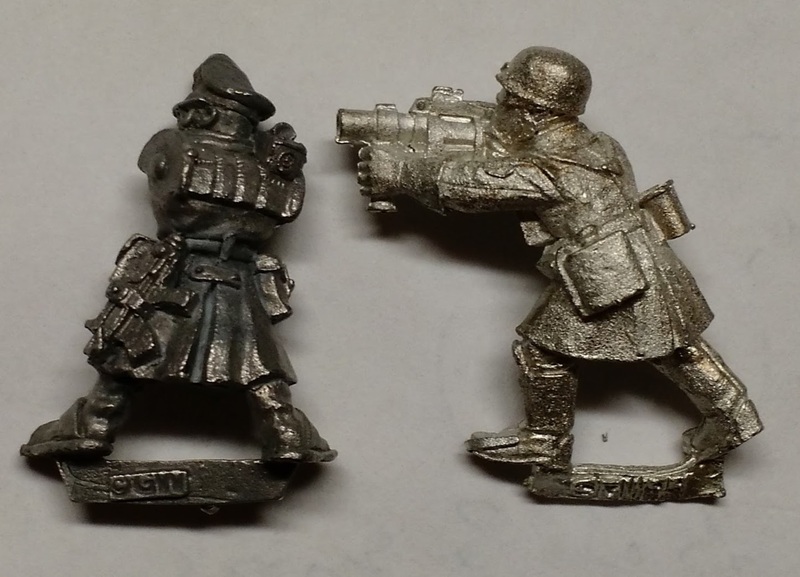 Here is the stripped figure compared to a Steel Legion grenade launcher trooper, also showing the backside of the miniature, where you can see that he has a pouch and a old style bolt pistol held to his belt by a strap. You will probably notice that he is a bit short, and his neck is a bit stumpy. Fortunately this grenade launcher trooper is going to provide the legs, and the neck will be less of an issue from the front I think, as the gas mask will provide some cover. Here he has gone from being a bit short, to being a bit tall, which was a result of the difficulty I had with pinning (I even used a power drill and made little headway on the white metal of the legs). There are also new arms from a Chimera commander (with bolt pistol) and a chain sword arm from a Steel Legion sergeant (now demoted to mortar loader). 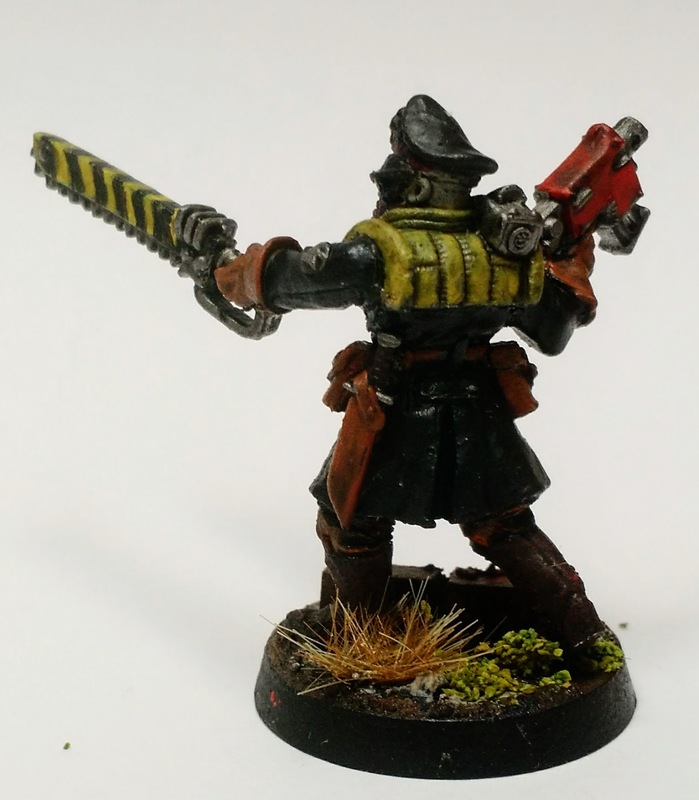 I also added a Cadian bayonet to replace the old style bolt pistol that I cut off from his left hip. 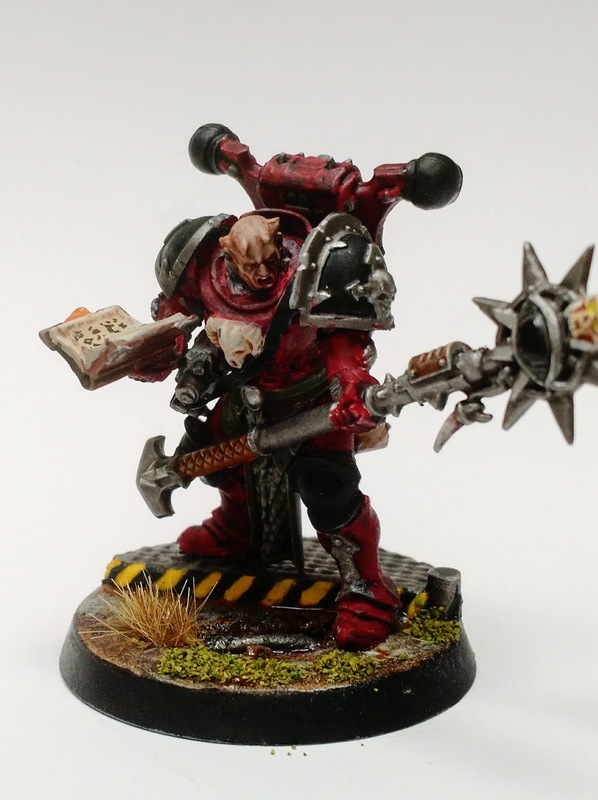 And here he is all painted up, generally following the painting for my Steel Legion figures. 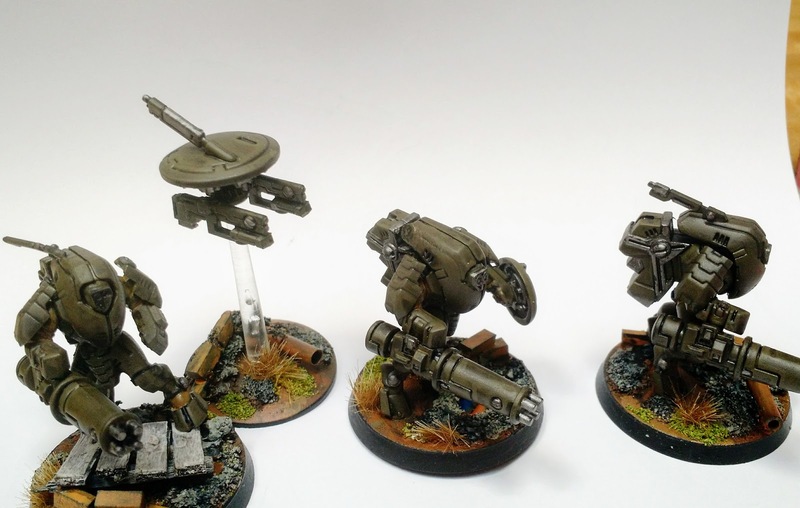 As always, I really enjoy this army, and after I finish up the remaining bits and pieces (heavy mortar, heavy stubber team, and sniper), I really need to consider if I want to make a second platoon to go with that planned company command...or maybe just a scout squad? 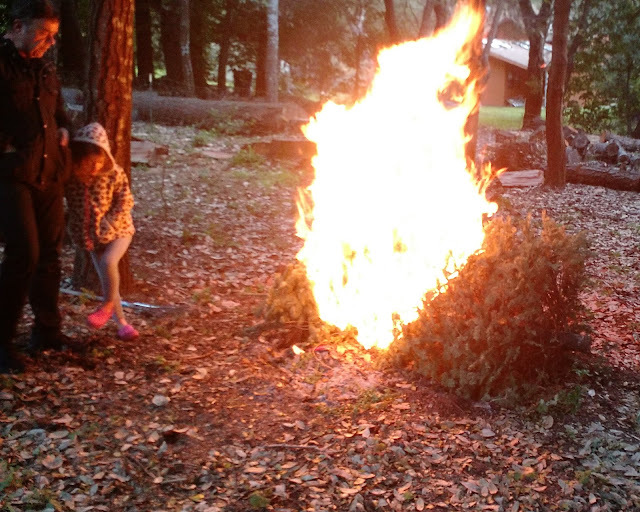 Well, Merry Christmas and Happy New Year to you, my dear readers. Christmas was busy, as I was finishing up a few gift miniatures for my sister and my nephews. I took the opportunity to finish a few of my other figures, so you should see some of them in the near future. I did not get much in the way of hobby items as gifts this year (and surprisingly no books either! ), but I did get a Neophyte Hybrids, which should yield some great figures when I get around to working on them. As one does, I managed to see Rogue One, and jolly good it was too. I expect to draw quite a lot of inspiration from the movie for various skirmish endeavors, and expect quite a lot of you to do so as well. (Jedha seems to be perfect for a rogue trader town). 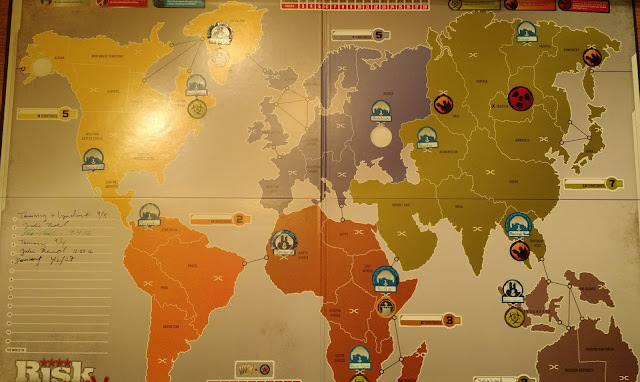 And a couple of rounds of Risk Legacy, which were slightly frustrated by a mispack. As all things must, this splendid long weekend came to an end, but not before a salient reminder of the dangers of Christmas tree disposal. 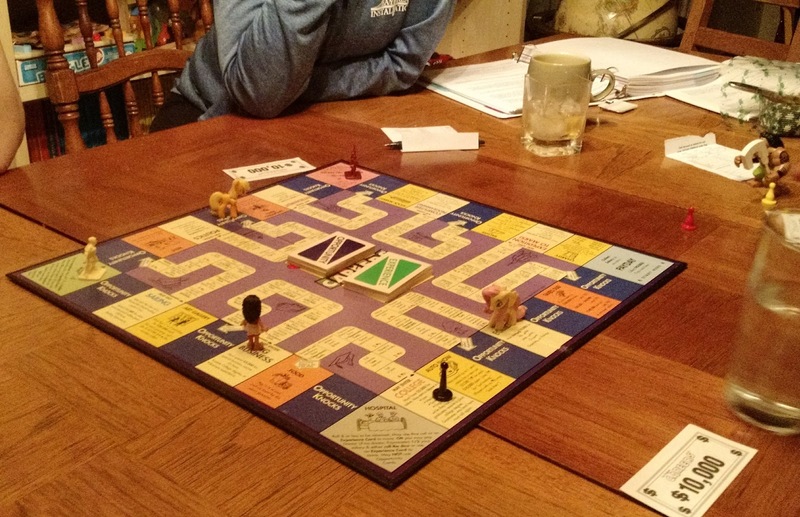 How did you spend the holiday period?